Samsung has stolen Apple’s marketing momentum with its smart ads that poke fun at Apple, says Ken Segall, a former ad man for Apple.Segall isn’t just any former Apple marketer. He put the “i” in “iMac,” and worked closely with Steve Jobs. For years, he says, that Apple’s advertising was impeccable. And no company could touch its ability to build its brand and sell its products. That’s all changed with Samsung which has successfully cut into Apple with a two-pronged strategy. The first part of the attack for Samsung is ad volume. It just spends crazy sums of money on marketing. That wouldn’t mean much if Samsung’s ads were terrible. They’re not. The second part is clever, entertaining ads that are “well produced, well written and seem to be striking a nerve,” says Segall. Apple, meanwhile, continues to make its products the star of its ads. There’s a time and a place for product-driven advertising. But, Apple should want to mix it up with some narrative-type ads. Segall notes that Samsung is doing special Super Bowl ads. It’s doing special Oscars ads. It’s creating clever, unique messages for each of those spots. When Apple did try to do a new narrative ad recently it was a massive flop. 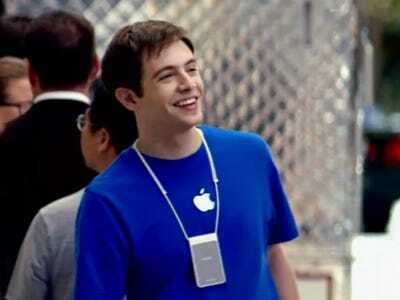 It very briefly ran ads with the Genius from the Genius Bar helping people. They were heavily criticised and quickly pulled. Segall thinks (hopes?) Apple and its ad partner Chiat is working on new ads to combat Samsung.